While the sight of a cherry picker out at sea would normally be a cause for great concern, this was not the case in 2006 when Facelift sailed their way to victory in a unique charity event. Paddle around Brighton Pier, in aid of The Rocking Horse Appeal, RNLI and Surf Aid, saw a number of organisations invited to build a raft that represents their business and paddle it around the West Pier. Although Facelift was originally approached to donate a cherry picker in order to get aerial photography of the event, Managing Director Gordon Leicester and Workshop Manager Peter Loseby’s interest was piqued and they decided to submit their own entry. The obvious way to showcase Facelift was to use a cherry picker. However, this is certainly not the easiest thing to try and incorporate onto a working flotation device. Undeterred, the team decided to weld together a number of steel barrels which ended up as two buoyant hulls. The barrels were then joined by an aluminium frame from which an articulated boom was mounted. Fake hydraulic rams were also used to make the vessel look as realistic as possible. 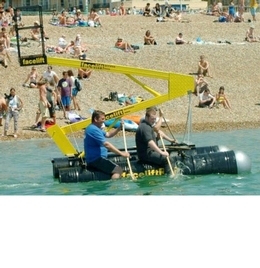 The boat, nick-named the ‘barrelpicker’ took four weeks to build but all the time and effort was worth it when the four-man crew safely steered their ship to first place in the competition, with the trophy presented by none other than Brighton’s own Fatboy Slim.